I wasn't sure how living in base housing was going to be and worried about how I would make everything we own fit, how I'd make it feel like home without being able to change things that bothered me, and how I would be able to stand a completely white interior. Every single wall, ceiling, door, and inch of trim in this house is white. It's not that we couldn't paint if we wanted- we didn't want to. Who wants to paint a house only to have to return it to white in what could be less than a year's time? Instead, I slowly learned to like the way that most of our things work on a white wall. 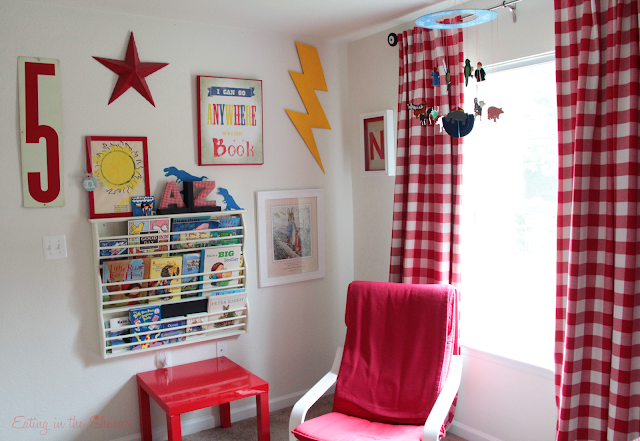 Today I'm sharing some photos of our son's room. Since we are getting ready to move again, I'm trying to take photos of my favorite spaces in this house so that I'll be able to help the kids remember what we call the "Blue House." Out of all of the white walls in this house, their walls were the easiest to brighten up. 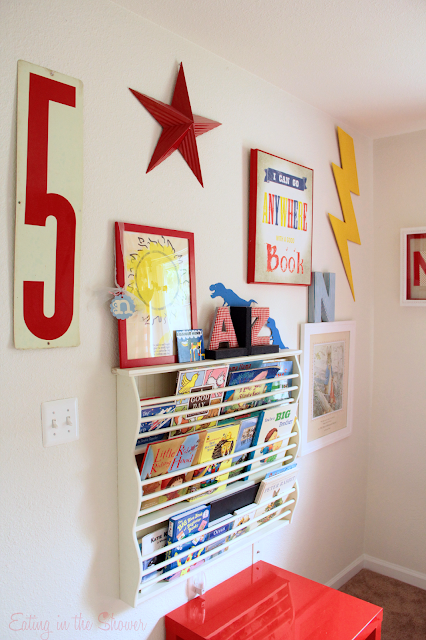 The kids' rooms were the first to feel like 'home' and even if they don't always remember these details, I'll be able to show them the photos. 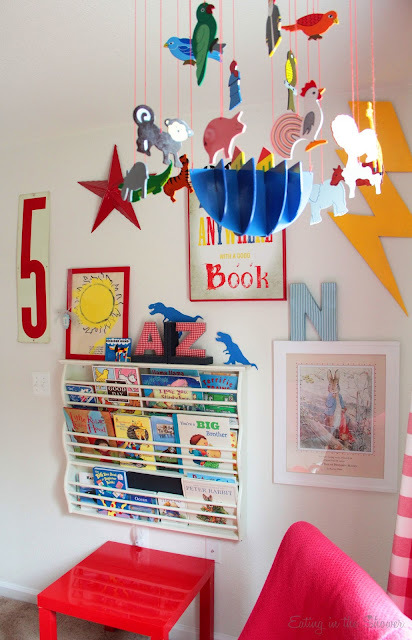 Our son turned five not long after we moved here and his room is playful and full of bright colors. 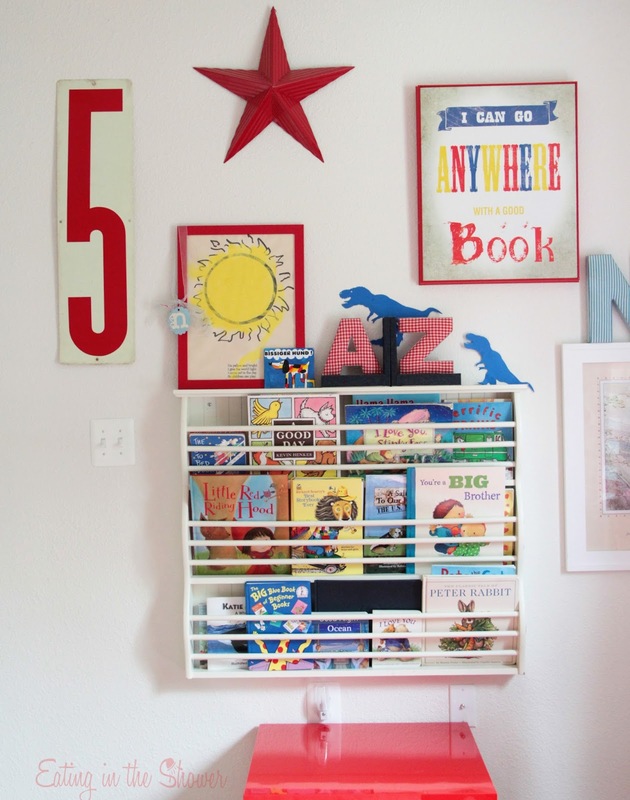 This little book wall is my favorite part of the room and turned what was a small, white, empty box feeling room into a space that feels happy as soon as you walk inside. The Noah's Ark mobile has hung in all of his rooms since he was born and even though he's outgrowing having a mobile in his room I plan to hang it in one more! The gas station number sign for his age and some of his own artwork combine with whatever objects come and go from the shelf. Our neighbor made him the lightning bolt and I painted it yellow. The best part about finding ways to add color to base housing without painting- as we get ready for another move- is that all of these things are coming with us! 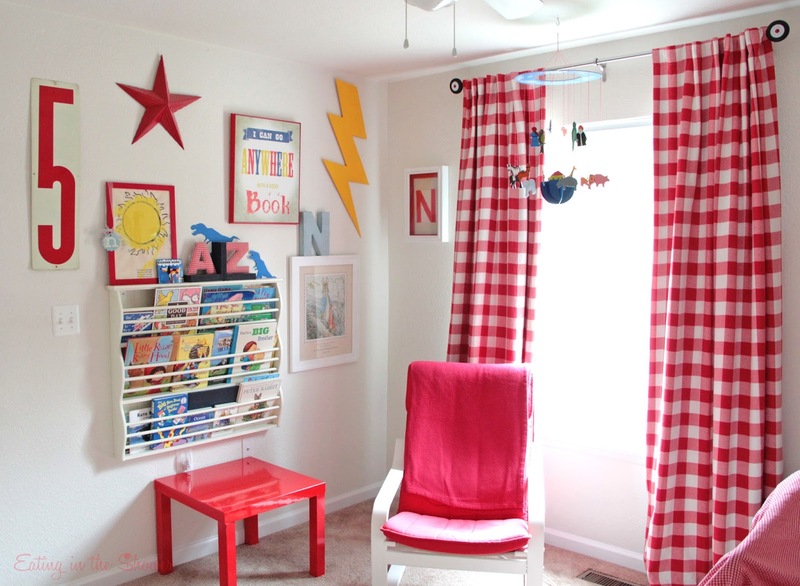 I'll share some pictures of our daughter's room next time.